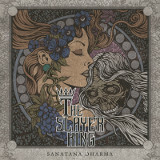 I started listening to Greek power trio The Slayerking's debut album, Sanatana Dharma, about a week ago, and somehow wasn't feeling it at the time, perhaps because it seemed so offbeat at first. A few evenings ago, I tried it out again, and this time really enjoyed it, so apparently one has to be in the right mood for it to work its magic. Primarily doom metal, it mixes in progressive rhythms and an epic vibe, creating a grand sense of the fantastic that starts with the impressive cover art and continues on through the music. Mixed in with the more straightforward doom elements are the unusual bits that make this so enjoyable -- She Is My Lazarus comes with a buzzing synth sneaking in between the old-fashioned, wah-wah-inflected guitar solos, accompanied by unintelligible whispers. Bassist Efthimis K's vocals range from the deep, solemn tones with which any Reverend Bizarre listener would be familiar, to ominous growls that are more like death metal vocals. Did I mention there's a death metal influence as well? Well, there is -- not just in the vocals but in the riffs at times. The guitar turns effortlessly from crunching out gravestone-heavy guitar riffs supporting bulky song structures, to doing delicate decorations for the drum-and-bass combos on the verses, such as on Sargon of Akkad -- and occasionally just spacing out into mind-expanding wah-wah fugues. What's especially impressive to me on this one, for all the ridiculous amount of genre mishmash they've put together, is the band's restraint. It feels like they never overdo anything on this album, in a genre where it is very easy to fall into bad habits; you can feel their influences, but their sound is so unique that not only do disparate elements join together seamlessly, they work together to provide extra shading to the songs. Witness My Lai, which is furtive-sounding on the verses but jumps into full-on epic doom metal on the shouted choruses. Kostas K's guitar soloing on this one is simply beautiful melody-wise, but for all the melody, the music always retains its menacing edge; no Warning-style emotion for this group. The Slayerking credits a lot of influences with its sound, but there are still more buried in Sanatana Dharma, trying to find a way to get out. Anyone interested in avant-garde or progressive doom is almost certainly going to like this one (you might need to give it a few listens to get the breadth of what they're doing, as I had to). Check it out yourself at http://the-slayerking.bandcamp.com/releases.